For my printer, I decided to make the frame from MDF. I got it from our local B&Q DIY store. They have a large wall-mounted saw which they will use to cut up your wood for you, if you ask. I made a cutting plan which meant that they could cut all the pieces which were supposed to be the same width one after the other, so they didn’t have to adjust the marker and possibly end up with a slightly different size. The arch in the gantry then needed cutting. Fortunately, my father-in-law came to the rescue with his workbench and jig-saw. Then I decided to paint it. This is optional, but bare MDF can absorb water and change size slightly, which is not good for a precision instrument. Painting it stablizes it in this respect, as well as making it look much better. However, this turned out to be quite an effort. I wanted to do it outside (a decision with which my wife heartily agreed), so I spray-painted it lying flat on newspaper and plastic sheeting. But I had to content with wind, dirt from the bricks I used to weigh down the newspaper because of the wind, and intermittent rain showers. Fortunately, we’d got 3 of the rear stays out of our wood rather than 2, so we could use one for paint testing. I had to do two coats, both sides. Still, due to uneven coverage, fingermarks, etc., the finish is not what I’d like it to be. 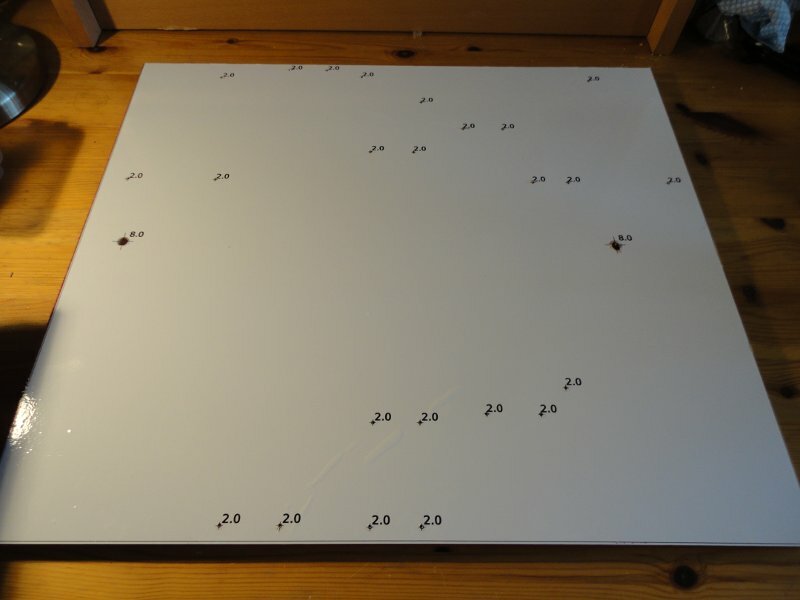 Each sheet needed holes drilling, according to the drill templates which are automatically generated from the design. The templates are significantly bigger than a piece of A4 paper. One can print them out in A4 panels with cut marks and join the result together, and I did that for all of the pieces but the base. (Wishing to avoid Adobe Reader, I tried to do it with open source tools. This was a pain to work out; see the build instructions for how it’s done.) But the base is large enough and has enough holes spread across it that I wanted to get the sheet printed on a single piece of paper. I took it to a local print shop and, due to a misunderstanding, they printed it on sticky-backed vinyl instead! I thought this might be excellent, because the glue would keep the sheet aligned, and the printer demonstrated that the vinyl peeled off wood very easily. And indeed, once we’d worked out how to apply it square and (mostly) unwrinkled, it looked great. However, it turns out that it doesn’t peel off painted wood as easily, particularly if it has been left for 3 or 4 days while you find the right size drill bits! A lot of glue was left behind :-( White spirit didn’t help, but started lifting the paint finish. Fortunately, I remembered I had a small bottle of “sticky stuff remover”; I have no idea what’s in it, but it’s magic. It lifted off the residue without removing (much of) the paint. Lastly, it turns out drilling MDF without another piece of wood underneath leads to messy exit holes; particularly on pieces where both sides can be seen, using a drill block is essential. Next up: starting putting together some of the sub-assemblies. Hi, I’ve recently been looking into 3D printing, so will keep watching this. I’m from sheffield too, how much do you think this build will cost you all together? You may be able to find a friend to print you the parts for free (although you need good quality), particularly if you hang out at the GISTHub, where there is a 3D printer community. And there are cheaper electronics available, particularly if you are happy to assemble them yourself.